Yesterday I shared the first five days of the Photo-A-Day challenge. I promised that I would share a few of my pages and how I've decorated them up to be cute and fun and yet also help me keep track of things I either need to remember to do or appointments. Added some washi tape and a cute sticker along with using various jell pens, so colorful and fun! I learned that jell pens might be fun but I need to keep the page open so it dries and doesn't smudge. Don't you love the little glasses on the bottom left? It's from a Barbie sticker pack I picked up at Michaels. On this page I'm starting to log things that I need to do to get my craft room organized. organizing my space. Hopefully I'll be able to make some progress this weekend. Yesterday I decorated the pages for the next 2 weeks and will add to do stuff this weekend. There are so many cute stationary items for sale, I love these little post it notes! it really makes these pages fun! I'm excited for the mailman to show up today! 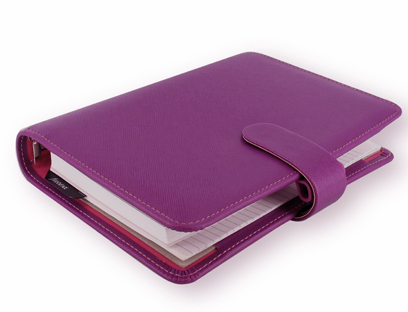 I ordered this purple Saffiano Personal Organizer. You ask, why do I need another one? Well, I've got a different plan in mine as to how I'll use it.